"PagePotato" is organizing Digital Marketing Learnshop in Bangalore along with the partnership of "YourStory" and "Learn And Teach Anything For Free". The aim of this workshop is to help Entrepreneurs and budding solopreneurs to get hands-on knowledge on correct ways of using digital media for marketing. Three eminent personalities from Bangalore Digital Marketing fraternity will be guiding you on 3 important topics related to digital marketing. 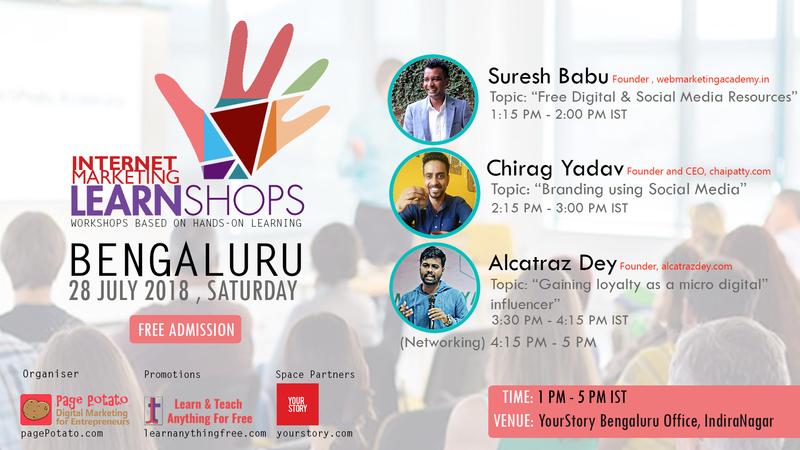 The workshop is Free to attend and will be at the YourStory head office in Indiranagar from 1 PM to 5 PM.